Micro LDPE pipe (feeder pipe) is used for delivering water from the LDPE supply pipe to water emitters such as drippers, micro jets or micro sprinklers. Due to its flexibility it can easily be manipulated to be fitted as required. Barbed fittings should be used to connect the micro pipe to the LDPE supply pipe, creating a water tight seal. It is recommended that micro pipe is not used in more than 1 metre lengths, as this can reduce pressure and effect efficiency. Hydrosure micro pipe is compatible with all correlating size fittings of Hozelock, Claber and Gardena. 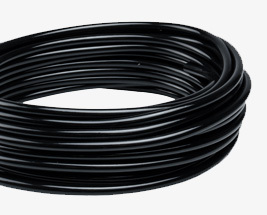 Water Irrigation offers a range of lengths to suit all requirements from 5 - 500 metres and offers both 4 and 4.6mm internal diameter. Micro pipe is available in black, brown or white to suit any environment.